The Magnum Rowtrac tractor is fully adaptable to narrow or wide row spacing and has the manoeuvrability and better flotation producers need. Building on 18 years of leadership in independent-track technology, Case IH has launched its new Magnum™ Rowtrac™ to the New Zealand market, with the distinctive-looking tractors expected to arrive in time for National Fieldays at Mystery Creek. Two new models, the Magnum Rowtrac 340 and Magnum Rowtrac 380, will be welcomed by any producer who has soil conditions that require better flotation and reduced compaction. A proven Case IH oscillating rear-track system is paired with front tyre options to fit virtually any row width. This system keeps the power on the ground through the tightest turns, improves manoeuvrability, reduces berming and improves operator control of the tractor. “Our new Magnum Rowtrac meets the unique needs of New Zealand farmers through a wide variety of row spacing and belt options,” explained Pete McCann, Case IH Product Manager, High Horsepower Tractors, who has just returned from the United States after seeing the global unveiling of the Magnum Rowtrac at the Farm Progress Show in Boone, Iowa. ​The Magnum Rowtrac delivers superior flotation and traction that provides benefits for the producer in all field operations. Pete says Kiwi farmers will also benefit from the improved traction, flotation and weight distribution Magnum Rowtrac provides when pulling today’s increasingly wider, heavier cultivation equipment. “Timing is critical with high-value, specialty crops,” Pete said. The 8.7L engine cranks either 340 or 380 horsepower, depending on the model. 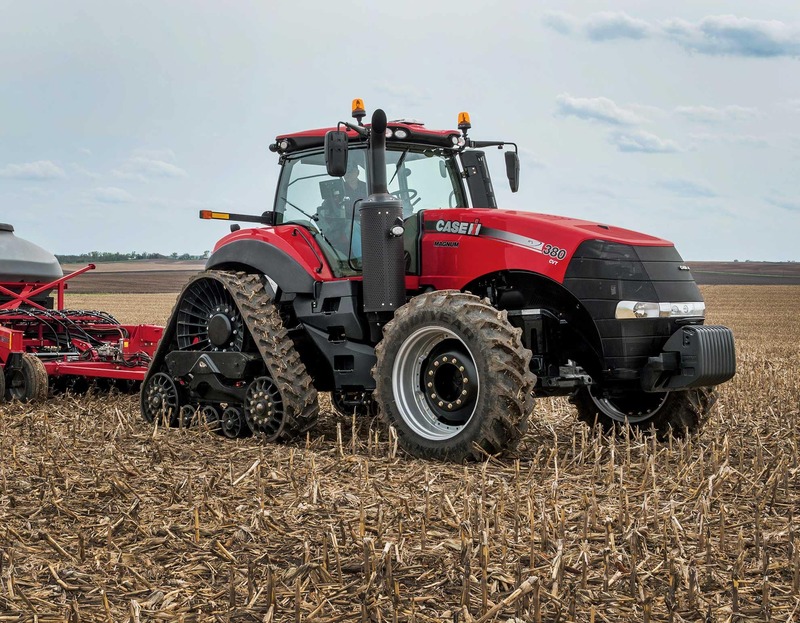 While flotation and traction are priorities for producers, it is important to note they might not need to purchase the optional front duals for Magnum Rowtrac tractors. Case IH will offer a redesigned front tyre exclusive to the Magnum Rowtrac. The tyre will feature a large footprint, further reducing soil compaction from the front end of the tractor. With the Magnum Rowtrac, Case IH also introduces an optional front axle. Producers now can choose from among four front-axle options. The new Universal Wide front axle is six inches wider on each side than the standard axle. The Universal Wide axle offers ultimate versatility: it works with all row spacings and can be adjusted for all tread spacings. The Universal Wide axle and the standard axle are available as suspended or standard configurations. New lighting packages offer optional LED lights at different intensities, including a 360-degree LED setup for superior night time operation, standard on Ultimate models. “The Magnum Rowtrac completes the Case IH full line of equipment by providing a track tractor that’s fully adaptable to narrow or wide row spacing and has the manoeuvrability producers need,” Pete said.